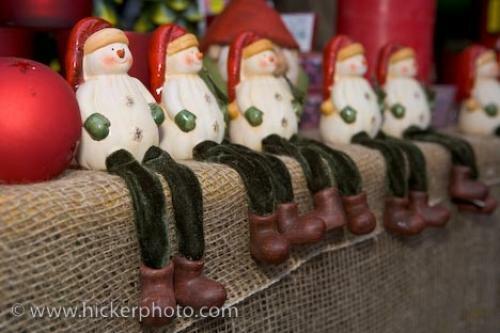 These snowman Christmas decorations hang their floppy legs over the edge of the display at the Hexenagger Castle markets in the town of Hexenagger, Bavaria, Germany. The snowman Christmas decorations are all lined up in a row ready to be taken home. These snowman Christmas decorations wait patiently with their legs dangling over the edge, to be purchased by someone at the Hexenagger Castle Christmas Markets in Hexenagger, Bavaria in Germany. When visiting the Christmas markets, which can be found all over Germany in the holiday season, it is not uncommon to see cute ornaments such as these snowmen here and all kinds of festive decorations, food and drink can be purchased at the Christmas markets. Snowman Christmas decorations are quite a popular item now in which to decorate your home or your tree during the festive season. Snowmen are seen as something that can be both jolly and cute and appeal especially to children with their kind smiles and festive outfits. Photo of snowman Christmas decorations at the Christmas Markets at the Hexenagger Castle, Germany. ... The Christmas markets transform the entire grounds of the castle and turn the outside in to a winter wonderland with bright lights and Christmas music. The castle uses over 30,000 lights and torches to create the festive atmosphere and on the four weekends leading up to Christmas, many come to visit and to purchase ornaments such as the snowmen seen here. I photographed this photo with the digital SLR camera model Canon EOS-1Ds Mark II, aperture of f/4.5, exposure time of 1/60 sec. on ISO 100, as always I used a original Canon Lens, the focus lenght for this picture was 51mm.